There is no better shortcut to looking sophisticated, glamour and predacious than by throwing on a leopard coat. I want to show chic ways how to wear this great cover up in the streets. I would say it's a kind of glamour rock and roll outerwear that has a fierce and instantly sultry look. If you want to release a predator, then the best way is to try on one of these amazing cover-ups. The best thing about these jackets is that you don't have to spend a fortune to pull off this trend, as it easy to wear with absolutely everything. No matter if you pair it with jeans, tee or a cool little black dress (LBD) you will look cool and very individual. 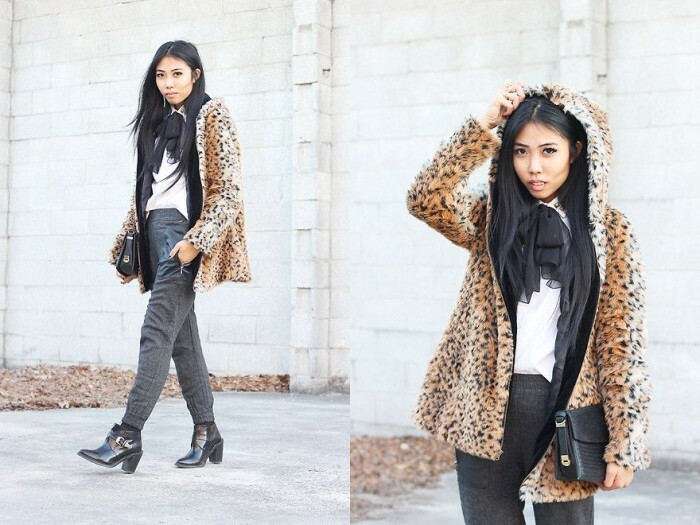 Leopard print is already a timeless trend that looks great on classic outerwear pieces. This pattern can go a long way in livening up any outfit. Another great thing about this cool staple is the contrasting colors that make you noticed in the crowd. Scroll down the mouse to see the best ways to wear it in the streets of big cities. Here we see a woman who appears in a cool cover-up styled with a relaxed black V-neck pullover, formal shirt and ripped, cuffed boyfriends. How about some glamour touches in your look? We see a black fedora, collarless cover-up, white pullover, black matte skirt and knee-high boots. How about Dandy touches that will surely make you noticeable. I love the burgundy hat, white blouse tucked in ripped skinnies. This outerwear looks great with white pullover and leatherette, cuffed slim-fit jeans. I love the retro look bag and silver metallic pointed-toe heels. There is kind of hipster touch in this outfit. We see below-the-knee cover-up styled with statement leather biker jacket, leopard snout pullover, cut-offs, pantyhose and combat lace-up boots. That's a classic urban look for those ladies who want to look kind of laid-back and off-duty. Here we see a crewneck collar coat worn with chic black top and leatherette slim-fit pants. 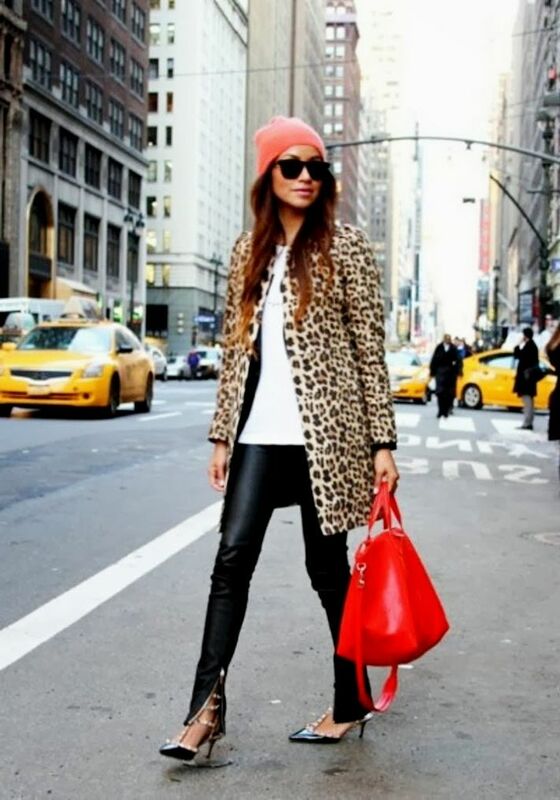 You can try on something different by wearing a leopard print coat with leather details. 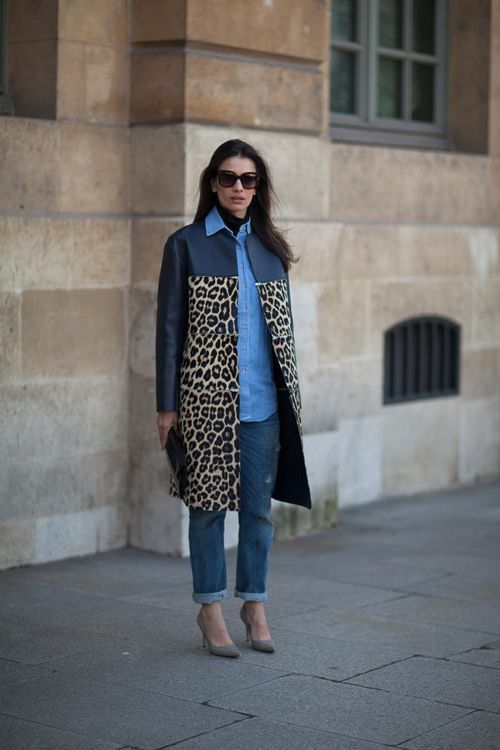 I love the way this outer garment is worn atop denim on denim trend separates. There is kind of Tomboy spirit in this outfit that consists of a black beanie, cozy coat, boyish black blazer, light grey pullover, black leather look leggings and casual trainers. If you want yourself an elegant look, then I highly recommend you to get inspired by this image.